During childhood, children learn and practice the skills they will need in their adult lives. Bullying is an unpleasant but inevitable part of life that happens in virtually every social group. If children don’t learn how to deal with hostility in their formative years, how will they manage when they grow up and have to face hostility from their co-workers, bosses, spouses and children? This course enables teachers to help students respond effectively to verbal comments. Includes video role plays that model and demonstrate methodologies. 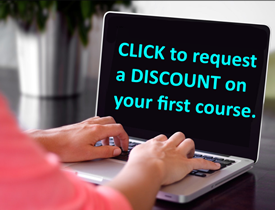 Click on the button below to register in this course. Want to learn more about protecting children? Enroll in the Child Abuse Prevention Package for Educators and SAVE $24. This was my first on line course. I have to admit I was a bit nervous,and my technology skills are not the greatest,but the instructions that I received from your sources helped me greatly.I will sign up for another class. Sorry I DIDN'T SIGN UP FOR MORE CLASSES. There's a person in my life who has been a long time "bully" toward me. Internalized, it's a very destructive situation but after examining the strategies presented here, I do believe that a response of kindness could be very effective. Bullies definitely look for reactions. They can be thrown off guard with a reaction they don't expect. That information in itself is extremely helpful. I've really enjoyed this class and learned a lot from it. Firstly, I love the idea of the "Law of Reciprocity". It is difficult to be mean to someone who is genuinely nice to you and treats you as a friend. Secondly, I will not give others the ability to make me mad or upset. I can't control how a situation will play out, but I can control my reactions. By keeping my own emotions in check is how I will be able to ultimately control the situation. I think it's also imperative to teach our students this as well. I also liked not playing the judge. The reading was right, we don't have a J.D., so why do we rush to choose sides. By allowing the students the ability to problem solve for themselves, by asking questions, it puts the ownership on them and doesn't require you to act as a judge. There are many things that I have learned from this course. The first thing that I have already started in my classroom is not playing judge. Unless a student is hurt, I try not to play judge and place blame on either student. Secondly, I learned to not give others the power to make me mad or upset. I also use this one at home. As opposed to getting upset I think about the behaviors or words that I don't like and how we can change them. Thirdly, I enjoyed the aspect of giving students the power to solve their own problems. By teaching them things like ignoring mean comments or asking other people if they are mad at them, it empowers the child. I have learned numerous things from this course. I have already applied the Golden Rule in my classroom. When I asked my student "Do you believe it?" he responded "no" and the problem was quickly resolved. Training a person to see things for what they are and not allow the person who is antagonizing them to get the best of them is a key component to disolving a situation both immediate and in the future. Another aspect of the course that I love is the idea of treating your enemy as a friend. It is really hard to be angry at someone who is genuinely trying to be nice to you. I have learned about the golden rule, and I plan on teaching it to my students and using it in my own life. I think it important that people treat others with kindess in order to stop the bullying. I think that it is also important for individuals not to allow the other person to see that they are being hurt or feeling negatively because it just feeds the bully more ammunition and the behavior will continue. I just got off the phone with my mother, and she was annoyed at something negative that my grandmother said to her, and I responded with: "mom, you are giving her the power to make you mad!" From this course I have learned to use these practices in all types of negative situations, not just bullying! I was glad that the reading addressed our techniques as educators. The Law of Reciprocity is a practice that I plan to use in both my professional and personal life. The concept makes so much sense. It is much more difficult to be mean to someone who is nice to you. So, if someone is being mean to you, be the bigger person and be nice to them. You will start a positive, rather than negative cycle. This course has provided me with useful information about how to model proper behavior for my students as well as how to handle bullying situations that may occur both in the hallway or my classroom. I will remember to use the Golden Rule and treat those who have done me wrong with both kindness and respect. I will also encourage my students to do the same. I will also make sure that I do not take sides in a situation. I now see how this can be perceived by the individuals in the situation. Very good practical ideas how to deal with bullying in school. I also got some excellent ideas in helping my own children with bullying. I have implemented so many components of this class in a short period of time. I find myself as mediator a lot more in class as opposed to the listener. I definiteky see a difference in my approach to bullying in school and some of my students have commented on how well I handled a situation (in their eyes). At home with a 7 yr old daughter the toughest years of her school social life I have seen a new appraoch because of Izzy. I truly think that his role plays have empowered me, as a mom, to be a better listener to my own daughter and be more objective. I know this will be better her as she encounters bullies. I think the biggest thing that I am taking away from this class is my total change in perception on how to handle bullying, as well as how to teach my students how to handle bullying. I really enjoyed learning about the "golden rule" approach. I think it is extremely important to learn how to be nice to people even when they are mean. I think this was a very beneficial course. Thank you! I definitely feel I have learned alot about bullying and how to combat it inside and outside of the classroom. I have learned new strategies that I can pass on to my students on how to deal with bullies. For example, I can suggest that my students try to keep calm when a bully bothers them and simply thank them for letting them know the information. When bullies do not receive their intended results, they will find someone else to bother. This course has given me some great insights into bullying and how to give students tools to help themselves. Treating people the way you want to be treated is a sure way to decrease the incidence of bullying. Tools such as magic responses can be useful for students. I think that making students aware of these tools and discussing the issue of bullying will ultimately help to decrease the frequency of it in schools. I have learned that bullying can be a two way street. If you diffuse the situation before it gets worse it can really eliminate the problems. I plan on using the strategies I learned in this course when dealing with bullying in my classroom. This course has really opened my eyes to what bullying actually is. I always thought that if you are being bullied that you are without a doubt the victim but that is not always the case. There was a situation this week where a student threatened another kid in school and it turns out that the so called bully was have major problems at home with his parents. 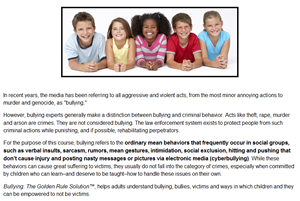 After taking this course, I feel that I understand the bigger picture with peer to peer bullying.